It is for this reason, as well as other added benefits, that we provide our customers the largest and most secure payment processor in the world: PayPal. It uses credit cards, online checks, does not require you to create an account and even permits interest free payment plans for select customers. 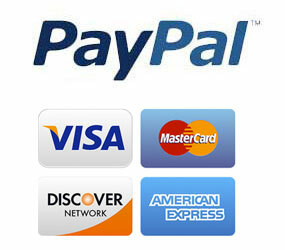 We also provide direct credit card payments secured via SSL which do not require interaction with any third party sites. Using this method, your credit card information is used only for that single purchase and is not saved by our systems.